Notre Dame, Louisville Triumph To Round Off Final Four : The Two-Way The Fighting Irish rallied to beat the Blue Devils 87-76, while giant-killing Louisville beat No. 2 seed Tennessee 86-78. They face rivals Connecticut and California, respectively, in New Orleans on Sunday. 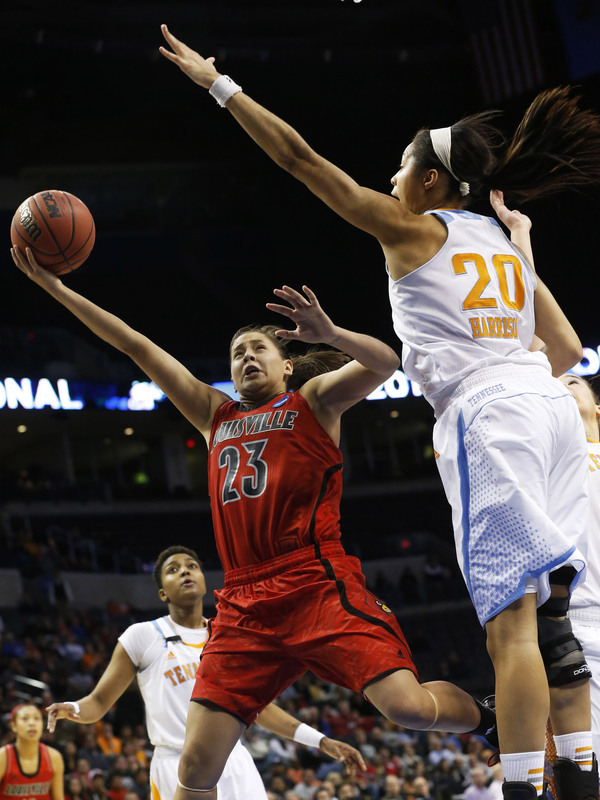 Louisville guard Shoni Schimmel (23) shoots in front of Tennessee center Isabelle Harrison (20) in the second half of the regional final in the NCAA women's college basketball tournament in Oklahoma City on Tuesday. And then there were four: Notre Dame rallied to beat Duke 87-76, while giant-killing Louisville beat No. 2 seed Tennessee to earn a trip to the Final Four. "Skylar Diggins shook off early foul trouble to score 24 points and Notre Dame rallied to beat Duke 87-76 on Tuesday night to earn its third consecutive trip to the Final Four. "Kayla McBride added 17 points while Jewell Loyd and Natalie Achonwa had 17 each as the Fighting Irish (35-1) won their school-record 30th consecutive game, earning a fourth meeting with Connecticut. Notre Dame has won the first three this season and beaten UConn in the past two Final Fours." "Two nights after taking down Brittney Griner and defending national champion Baylor, the fifth-seeded Cardinals (28-8) built a 20-point lead and then withstood a second-half comeback by the powerhouse Lady Vols (27-8) before celebrating another big victory. "When it was over, the Cardinals huddled at center court and celebrated. Tennessee headed home with a third straight loss in the regional finals, failing to make the Final Four for a fifth straight year. "Taber Spani led the Lady Vols with 20 points, and Meighan Simmons and Kamiko Williams chipped in 12 apiece. "Louisville's win puts both of the school's basketball teams in the Final Four."